For the 104th time in just a few years, Israeli soldiers and police officers demolished, Friday, the al-Araqeeb Bedouin village, in the Negev. Several Israeli army and police vehicles surrounded the Bedouin community, before invading it, and demolished it. 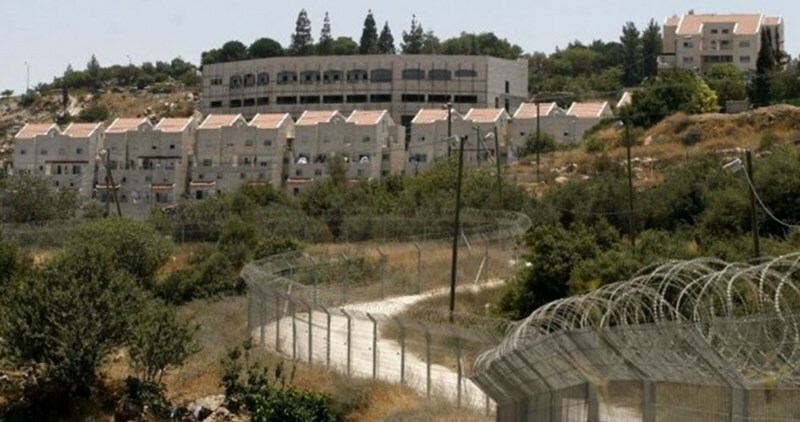 Resident Aziz SIyah Touri, who was repeatedly kidnapped and imprisoned by the army, including in June of this year, told the Maan news Agency that Israel aims at removing the residents from their lands, in order to build and expand its settlements and shopping centers, in the area. The village has been demolished at least 100 times since 2010, while the Israeli authorities are also suing the villagers, demanding them to pay the costs of demolishing their village, amounting to more than 2 Million Israeli Shekels. Friday afternoon in Bil’in village, the Israeli military blocked the main road toward the Israeli Annexation Wall and declared the entire area a ‘closed military zone’, just as demonstrators began marching down the road for their weekly non-violent demonstration against the Wall and illegal settlements. Before the protest began, the soldiers stopped local organizer Mohammad al-Khatib while he was on his way to his field to harvest his family’s olives, the main source of income for the Palestinian families in Bil’in. When the soldiers tried to confiscate his car, Mohammad al-Khatib staged a sit-in, lying in front of the car to prevent the soldiers from confiscating it. The soldiers then abducted al-Khatib and took his car. Local residents told reporters that this abduction was representative of the regular collective punishment suffered by villagers for holding peaceful weekly demonstrations against the occupation. 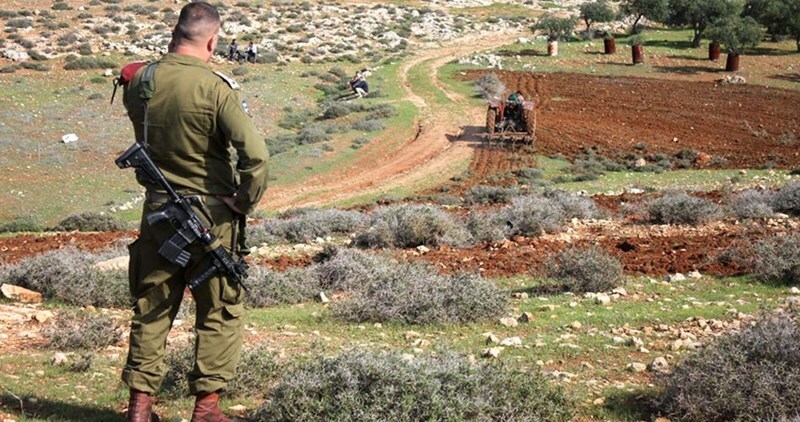 The Israeli Occupation Authorities (IOA) issued new confiscation orders to seize nearly 400 dunums of Jaloud village land to the southeast of Nablus. 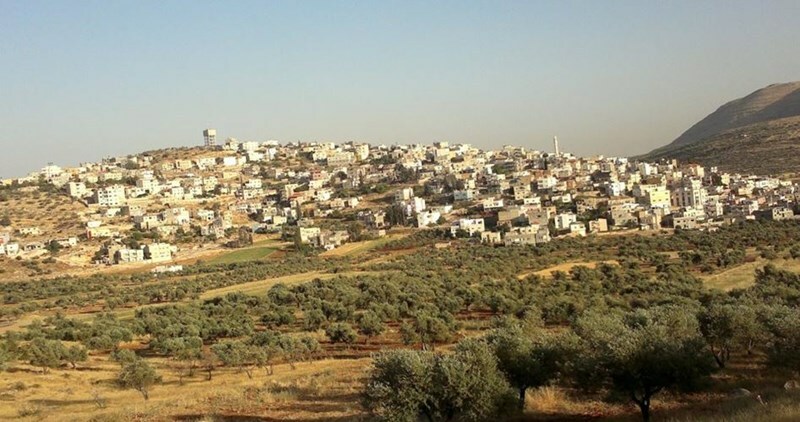 Head of the village council Abdullah Haj Mohamed affirmed that the IOA handed over confiscation orders to the village’s residents stipulating the confiscation of 400 dunums of their lands. The confiscation came as a prelude for the establishment of a new illegal settlement in the area, he said. In 1967, the IOA confiscated 16,000 dunums of Jaloud village land; however, the local residents managed to restore 1,700 dunums of the confiscated lands. Haj Mohamed pointed out that the local residents were given only two weeks to appeal against the confiscation order. Israeli Education Minister Naftali Bennett called Thursday for annexing West Bank to Israel. Speaking at a conference honoring a late right-wing Israeli legislator, Bennett voiced opposition to the eviction of Amona, an Israeli settlement outpost in the West Bank built on privately owned Palestinian land in 1995 and considered illegal under international and Israeli law. Bennett called on supporters to give up their lives to ensure the annexation of the West Bank. "We have to make the dream come true, and the dream is that Judea and Samaria will be part of the sovereign state of Israel,” Bennett said, using an Israeli name for the West Bank. The education minister, who leads the religious Zionist Habayit Hayehudi party, called for an active policy to annex the West Bank, saying that the “path of concessions” has failed. “We can't keep marking the land of Israel as a tactical target and a Palestinian state as the strategic target," he was quoted as saying by Israeli newspaper Haaretz. The minister's speech came on the same day as the UN, the US and UK condemned Israeli plans to build 300 new homes for settlers in the West Bank. The Israeli occupation navy on Friday morning kidnapped two Palestinian fishermen off Gaza’s shore. 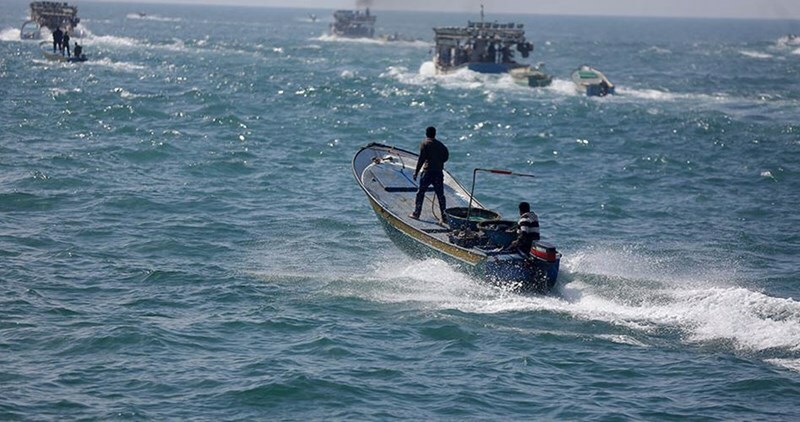 A PIC news correspondent said the Israeli navy forces opened fire on two Palestinian fishermen sailing off the al-Sudaniya shore, in northern Gaza. The occupation navy arrested the two fishermen Muhammad and Mahmoud al-Saidi and confiscated their boat before they dragged them to an unknown destination. Israeli police forces confiscated Thursday morning three Palestinian-owned mobile homes in Hazma town northeast of occupied Jerusalem. 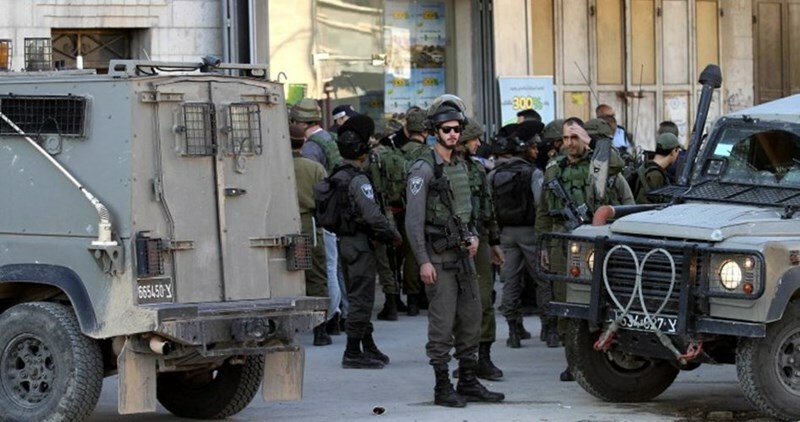 Quds Press quoted head of the village council Muwafaq Khatib as affirming that several Israeli military vehicles stormed the town and confiscated three mobile homes in the area. Khatib pointed out that the Israeli authorities have stepped up attacks against Hazma town as part of the collective punishment policy against Palestinians. Last month, Israeli forces bulldozed an agricultural land in the town and demolished its surrounding walls. The Israeli police stormed Thursday morning the headquarters of four Palestinian institutions, affiliated with the Islamic Movement within the Green Line, in Umm al-Fahm city. The four stormed institutions include QPress and the Supreme Committee to Support Jerusalem and al-Aqsa. 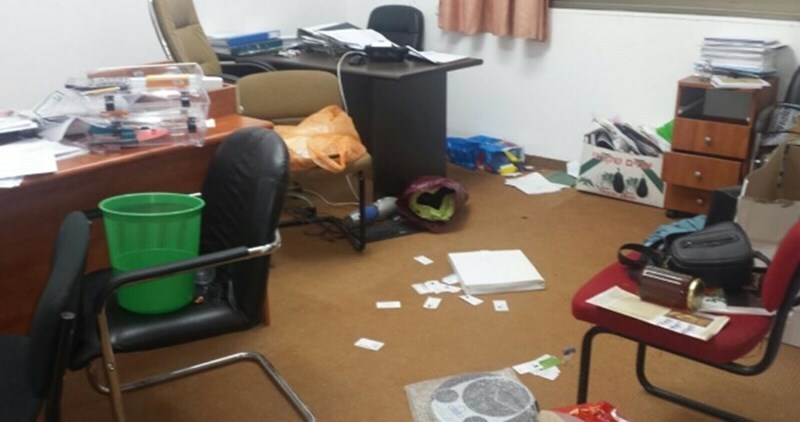 The Israeli police also confiscated equipment, laptops, and important files from the stormed headquarters. In November 2015, Israeli authorities banned the Islamic Movement headed by Sheikh Raed Salah and its 17 affiliated institutions. Israeli soldiers, accompanied by a number of armored bulldozers, invaded Thursday the at-Tass area, west of Kharas town, west of the southern West Bank city of Hebron, before bulldozing and uprooting 40 Dunams (9.88 Acres) of Palestinian lands. Abdul-Fattah Qodeimat, the head of Kharas Local Council, told the Maan News Agency that the lands were planted with almond and olive trees. He added that the soldiers also demolished several water wells in the invaded and uprooted lands, and that the wells belong to the families of Qodeimat, Halahla and Sa’id. The official denounced the Israeli violations, and said that the soldiers are trying to force the Palestinians out of their lands, in order to build and expand the illegal Jewish-only colonies. It is worth mentioning that, on Wednesday, the army invaded and uprooted 36 Dunams (8.89 Acres) near Kharas. 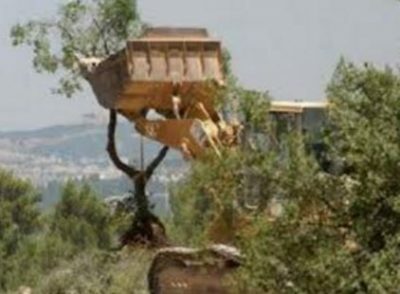 Several Israeli military vehicles, accompanied by armored bulldozers, invaded Palestinian lands in Beit Ola town, west of the southern West Bank city of Hebron, and uprooted five Dunams (1.23 Acres) planted with along trees. Media sources in Hebron said the soldiers surrounded the Palestinian farmlands, in Tawas area, west of Beit Ola, and uprooted them after forcing the family out. The sources added that the uprooted lands are owned by members of Saraheen family, in Beit Ola. Israeli occupation bulldozers on Wednesday morning leveled Palestinians’ cultivated lands on the access road to Beit Dajan town, to the east of Nablus. 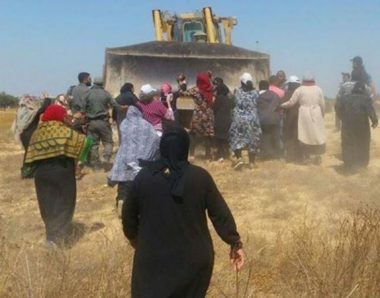 A PIC news correspondent quoted Beit Dajan locals as stating that a flock of Israeli occupation bulldozers razed their cultivated lands without prior notices. Ten days ago, Palestinian lands were bulldozed by the Israeli occupation army in the same area. The locals expressed fears that the access road, which has been closed by Israel for over a year’s time, would be opened to smooth the access of Israeli army jeeps into and out of the town's neighborhoods. The targeted road is located in Beit Dajan’s western corners. It had been closed for over ten years by the occupation army as part of attempts to curb anti-occupation activism. A few years ago, the Israeli military forces reopened it and closed it again in early October 2015 following the Itamar anti-occupation attack. 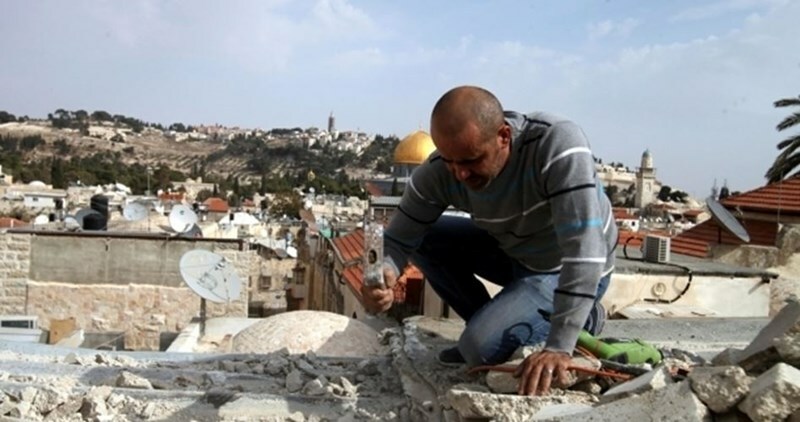 The Israeli occupation authority (IOA) on Monday forced a Palestinian citizen to demolish part of his own house in the Old City of Jerusalem at the pretext of unlicensed construction. 43-year-old Samer Dekaidek said that the Israeli municipal authorities had ordered him two months ago to remove the new section of his house, adding that he decided to carry out the demolition with his own hands after the deadline given to him expired. Dekaidek was living with his wife, two sons and one daughter in a one-room house, including a kitchen and bathroom, before he decided to build two more rooms and another bathroom for the kids, which he had to dismantle in order to avoid paying more than 60,000 shekels in penalties if Israeli bulldozers had razed it. “My sons are not living with me now in the house. There is no place for them. They are living in a dormitory…Regardless of what happens, we will remain steadfast in Jerusalem city. We may destroy today, but we are going to build tomorrow, and we are not leaving the city,” the homeowner said. Last month, five Palestinian citizens in Jerusalem had to raze their own residential and commercial structures after they received similar demolition orders. For the impoverished Palestinians in Jerusalem, Israeli construction permits are very expensive and often impossible to obtain; therefore, many of them build homes without permits, only to later face Israeli demolition orders and costly fines. Unable to afford the penalties, a growing number of Palestinians have faced the difficult choice of demolishing their own homes and property.